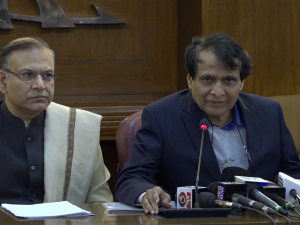 According to the recent safety audit of Directorate General of Civil Aviation (DGCA) conducted by Federal Aviation Administration (FAA) for International Civil Aviation Organisation (ICAO), DGCA’s rating remains as Category 1, revealed Suresh Prabhu, Union Minister for Commerce & Industry and Civil Aviation, at a press conference in Delhi. Accompanying him were Jayant Sinha, Minister of State, Civil Aviation; RN Choubey, Secretary, Civil Aviation and BS Bhullar, Director General, Civil Aviation. In 2014, India was downgraded to Category 2 in a similar audit. However, after the FAA audit of DGCA in July 2018, the administration has appreciated the commitment of the Indian government in ensuring effective safety oversight on India’s aviation system. 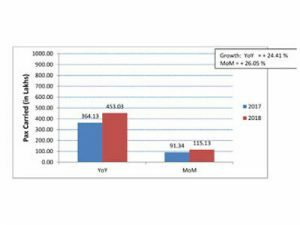 Domestic air traffic has grown by 21.20 per cent from January-August YOY, according to a latest report by Directorate General of Civil Aviation (DGCA). Passengers carried by domestic airlines during January-August 2018 were 913.95 lakhs as against 754.11 lakhs during the corresponding period of previous year. 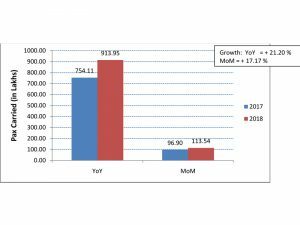 The passenger load factor in the month of August 2018 has shown increasing trend compared to previous month due to beginning of festive season, the report said. 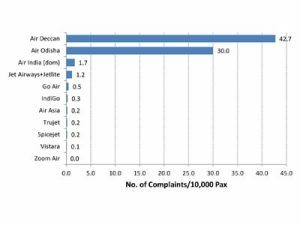 In June, a total of 677 passenger related complaints has been received by scheduled domestic airlines, according to a DGCA report. The number of complaints per 10,000 passengers carried for the month of June has been around 0.60, the report further said. JetSetGo has announced the acquisition of Indo Pacific Aviation, India’s oldest non-scheduled aircraft operator (NSOP) with operations in India. 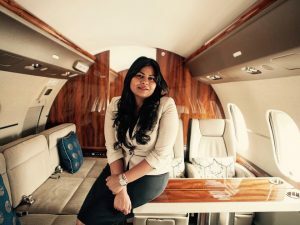 Speaking about the acquisition, Kanika Tekriwal, CEO, JetSetGo, said, “As the oldest NSOP, Indo Pacific has been instrumental in many ways in the growth of the private jet and helicopter market in India. Indo Pacific has far too many firsts to its credit and we are excited that this acquisition brings together the values of the old with the dynamism of the young. This acquisition now gives a significant boost to our ability to grow our fleet and offer unique services and next generation aircraft for personalised on-demand mobility.” Aggregating India’s available private jets and helicopters for the first time, JetSetGo now has pan-India presence with 2,800 aircraft movements executed in the last financial year. Typically managing and executing chartered flights through DGCA approved non-scheduled operator permits that are owned by others, the acquisition of Indo Pacific Aviation now gives more flexibility to JetSetGo to directly manage its own fleet and to provide on-demand air connectivity. It will also offer its customer’s aircraft sales and acquisition, fleet management and other aviation support services. 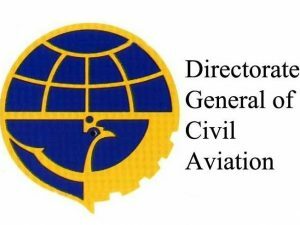 Government approval from the DGCA and Bureau of Civil Aviation Security (BCAS) was obtained prior to completing the transaction. 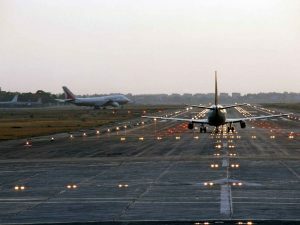 The number of passengers carried by domestic airlines during January and August, 2017, were 754.11 lakhs as against 644.68 lakhs during the corresponding period of the previous year, thereby registering a growth of 16.97 per cent, according to the latest data released by the Directorate General of Civil Aviation (DGCA). 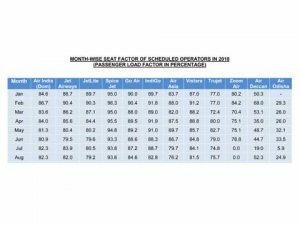 In terms of Passenger Load Factor, SpiceJet was ahead of its peers with 94.5 per cent PLF in the month of August. 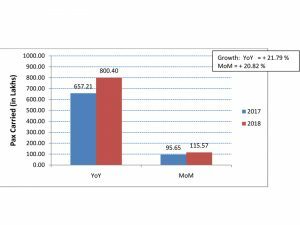 IndiGo ruled in terms of On Time Performance (OTP), recording a percentage of 86.6 per cent in OTP.